It was a real honour to launch the new wallpaper editions to our ‘My Country’ design with origin Aboriginal interiors collection at Decorex 2018 amongst much admired brands including Timorous Beasties, Rapture & Wright and Thibaut. Bay Gallery Home delights in people coming across it for the first time and there was no shortage of enraptured people on our stand at Decorex 2018. The artists we represent continue to explore the bountiful botanic aesthetic of the Australian outback sharing with us paintings of exquisite detail. We strive to replicate the painting as close to the original piece as possible thereby retaining the integrity of the artists original purpose when executing it. Bay Gallery Homes’s Michelle Blue wallpaper is featured in the October edition of the World of Interiors amidst a sea of beautiful fabrics. We launched three new ‘My Country’ botanical wallpapers last week at Decorex: Betty Pink, Joycie Yellow and Daisy Brown. 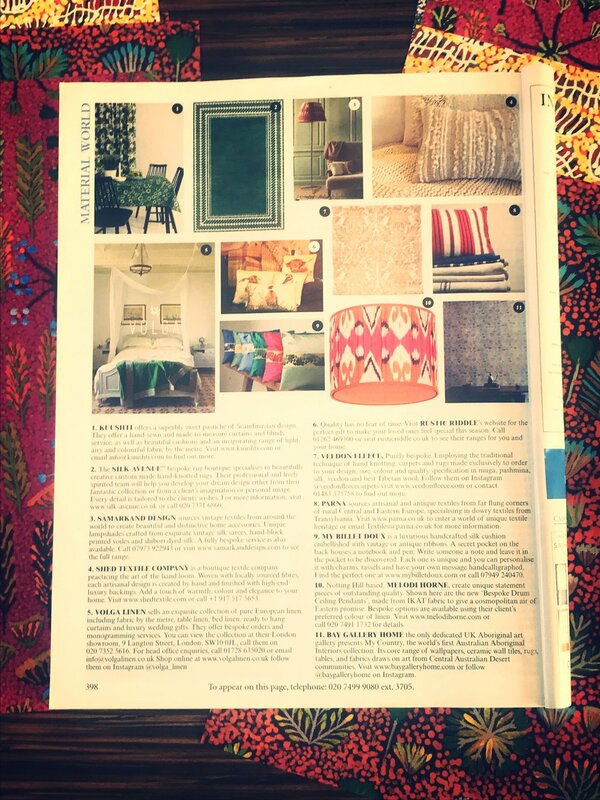 Thank you Lux Life Magazine Leading Designers Awards for our Award for Excellence in: Homeware & Accessory Design for our 'My Country' Aboriginal interiors collection. We'd also like to thank the hugely talented artists whose paintings we choose and transform into interiors products. 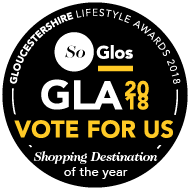 We are proud to announce we've been shortlisted for three categories in the So Glos Gloucestershire Lifestyle Awards including Independent Shop of the year, Homes & Interiors Business of the year and as part of Tetbury Edit for Shopping Destination of the year. Bay Gallery Home is working hard on creating 'Songlines' our first collection of fabrics based on paintings by artists we proudly represent. We have developed the world's first Aboriginal velvets available in three colours with slightly differing depictions of the Goanna Dreaming (Warnu Jukurrpa) - essentially a love story set in the Central Desert of Australia. In keeping with our 'design with origin' ethos we have been faithful to the original artwork in the design work thereby protecting the Dreamtime story and the intent of the artist. Keep an eye on the website over the next month or so as beautiful tableware, blinds and cushions will be amongst our first offerings. We're off to Surface Design at the Business Design Centre in Islington today. We have three new wallpapers under development so will be meeting with various collaborators at the show to discuss these and other exciting plans we have. It's always good to see developments in the surfacing world and where our new products might find their place market. Wish list is to work with Kit Kemp of Firmdale Hotels who, among others has worked with A Rum Fellow who we admire greatly. Below you can see a sneak preview of our 'My Country - Yellow' available soon. Joycie Pitjara Morton painting, selected on a trip to Australia a year ago, translated into a stunning wallpaper. Joycie will receive money for the sale of each roll her designs appear on. 'My Country' - Blue wallpaper depicting Kangaroo and Pigweed, found all over the Central Desert looking beautiful with chinaware designs by the world renowned artist Murdie Nampijinpa who paints Two Dogs Dreaming. Murdie is one of the elders sometimes known as the "first contact" group who lived a nomadic traditional lifestyle with their families before the "white fella" made contact. This generation performed ceremonies that, in some cases, are no longer performed but the Dreamtime stories are still told so subsequent generations can maintain their language and connection to the land - their Country. Original artwork by Murdie is available from www.baygalleryhome.com. These paintings were selected on our last visit to the outback. There's a rawness, depth and spirit to them that speaks to you from thousands of years ago. We are closing for our Christmas break midday 23 December 2017 so would like to thank our clients and collaborators for your support over 2017. Many exciting things are in the offing for 2018 so do keep an eye on our website, Instagram, Facebook, Twitter and Linkedin feeds. On behalf of the Aboriginal artists we represent we'd like to thank you for supporting their artistic endeavours and communities. Wishing you a very Happy Christmas and wonderful 2018. Our Art gallery seeks to showcase the versatility of the contemporary Australian Aboriginal artists, whose brilliant and diverse work is rooted both in the very real modern-day challenges of their culture & their rich heritage. One of these artists is Geraldine Napangardi Granites, who brings her own dynamic, modern painterly interpretation to a traditional subject matter : the Snake Vine Dreaming, or Ngalyipi Jukurrpa. The Snake Vine Dreaming Geraldine paints is associated with a specific country in the Australian Central Desert: Yanjirlpiri, or ‘star’ (known as Mt. Nicker), lying to the west of Yuendumu. In Aboriginal culture, Dreamings have specific ‘kirda’ (owners), and in the kirda of this Dreaming are the Japaljarri/Jungarrayi men & Napaljarri/Nungarrayi women. Geraldine is one such Napaljarri/Nungarrayi artist, the daughter of the celebrated artist Alma Nungarrayi Granites and granddaughter of Paddy Japaljarri Sims (dec) and Bessie Nakamarra Sims (Dec): two of Warlukurlangu Artists Artists Aboriginal Corporation founding artists. Born & bred in Yuendumu, she lives locally with her four children and has developed her artistry by observing her grandfather’s art and that of Judy Napangardi Watson, a Warlpiri artist at the forefront of a move towards more abstract rendering of Dreaming stories. In Snake Vine Dreaming traditional iconography, sinuous lines represent the Ngalyipi (snake vine), and straight lines represent the witi (ceremonial poles) and karlangu (digging sticks). Geraldine's painting pools from this tradition, whilst giving us a visual representation of how intricately interwoven this plant is in the daily physical & spiritual life of its people, and the profoundly interconnected relationship of the Aboriginal people to Country. The snake vine, or Ngalyipi [Tinospora smilacina]) is found in the trees and shrubs of sandy spinifex plains and sandhills, this green creeper has many uses in daily life and is of great ceremonial importance. The vine is made up into as a shoulder strap to carry parraja (coolamons) and ngami (water carriers), or exploited for its medicinal uses: as tourniquets, and its leaves and vines are used as bandages for wounds. The Warlpiri people sometimes chew the leaves to treat severe colds, or pound the stems into poultices to cure headaches. The importance of Yanjirlpiri cannot be overemphasized, as the sons and grandsons of Japaljarri and Jungarrayi men are brought here from as far away as Pitjantjatjara country (to the south), and from Lajamanu (to the north) to be initiated. This witi ceremony is performed at night under the stars, during which Napaljarri and Nungarrayi women will dance but then look away and block their ears when it is time for the men dance. In men’s initiations, Ngalyipi is used to tie the witi (ceremonial poles) to the shins of the dancing initiates, and to tie yukurruyukurru (dancing boards) to dancers’ bodies. You are always welcome to pay a visit to our Art gallery in Tetbury, Gloucestershire or to browse through its digital counterpart in the ART section of this website. We regularly post blogs on the provenance of our artwork. If you are interested in learning more about Dreamings, do have a read of our blog The Dream before the Art. Detail from a painting we will be bringing back to Bay Gallery Home's Gallery, a fine example of the ever-evolving work of contemporary Australian Aboriginal Artists. Here's a detail from Australian Aboriginal Street Art in Papunya, by Candy - a dynamic work of Art that feels full of expression and relevance. Mount Conner, also called 'Fool-uru' by locals for so often being mistaken for Uluru.. Some of the rich stylistic variety of contemporary Australian Aboriginal artists, each incarnating the Artist's experience and connection with Country, their land and identity heritage. Our beautiful My Country GREEN wallpaper & Lilly Kemarre Morton's Art : depictions of the Australian bush & botanical landscape after the rains. Bay Gallery Home's My Country Interior wallpapers, ceramic wall tiles & rugs are a very first in the history of interior design, bringing this beautifully versatile, intricate & joyful aesthetic into interior spaces and decors. The venerable Artist behind our wallpaper: Lilly Kemarre Morton, proudly holding one of our My Country interiors brochure. As we continue on our Art - sourcing trip in Australia we have had the opportunity to meet up with the artists involved in our inaugural Interiors collection and share with them the fruits of this collaboration, and its fantastic reception – namely our WIN Award. It is one of the most rewarding aspects of this enterprise. My Country GREEN wallpaper in its full-scale splendour, bringing Art & a touch of colour into interior space. Tidal mark, Kings Canyon inside Watarrka National Park, Northern Territory, Australia. The Australian Aboriginal people are the one of the oldest continuous populations on earth, and their visual language is considered one of the world’s oldest Art forms, spanning over 50,000 years. The connection to 'Country' is essential. Their tribal Dreamings, creation and mapping myths, rituals and sacred topography inspire bold, beautiful abstract paintings featuring the landscape, plants and animals of Australia's central desert. The Aboriginals see no difference between themselves, the sky, the land and the animals they share it with. All are one and the same. Fun times in the studio! Bay Gallery Home believes passionately in respecting, supporting and promoting the Aboriginal communities it represents. Despite a way of life that continues to be endangered, the Australian Aboriginal people continue to exhibit the incredible resilience and adaptation to change that has sustained them over the many millennia they have inhabited Australia. Yet, they are at a cross road, and the contemporary Art movement now plays a significant role in giving them a voice. The majority of artists Bay Gallery Home represents are hard working, determined women providing themselves with an income to provide for their children. The money generated by the Aboriginal owned corporations creates mobility, educational and work opportunities across the community. Our artists are remunerated for the purchase of their works, and receive a percentage of any interiors' sale. Irrepressible creativity: very Arts & Crafts! Colour gems waiting for the right buyer. We have represented artists from the communities of Central Australia since 2008, and are proud to be one of the rare exclusively dedicated Australian Aboriginal Art galleries in the UK. Bay Gallery Home's relationship with the Central Australian Aboriginal artists is one of trust, founded on respect for their heritage and contemporary ways of life. In our dealings we have the utmost consideration for the codes of conduct and sensibilities that surround the provenance of this ancient Art & the multi-generational communities that keep the artwork alive & vibrant. Ghostgum tree in the Central Desert -a recurring pictorial motif in our My Country PINK wallpaper. Our Australian Aboriginal wallpapers bring original Art into your interior spaces in a whole new way. The inspiration for My Country PINK starts with the Central Desert land – its red dusty earth and sun-burnt grasses, and resplendent amongst it all the ghostly white of the Ghostgum tree with its beautiful gleaming bark & sculptural presence. Observing its solitary presence in this arid landscape, it is not hard to see why artist Ngwarraye paints it so distinctively, and why it is so engaging as a recurring pictorial motif in our My Country PINK wallpaper. In our design process, we take every pains to produce excellent wallpapers, taking account of scale and pattern repeats and colour dynamics so that in the translation between original painting & interior design product we keep the spirit of the artwork alive and present you with exquisitely beautiful products that will bring character & joy to your interior spaces. Alana Ngwarraye, the wonderful artist behind the original artwork for My Country PINK. Our My Country PINK, BLUE & GREEN core range of wallpapers from original artwork by Australian Aboriginal artists. Detail of My Country PINK, by Alana Ngwarraye for Bay Gallery Home. Detail of local flora from a vibrant painting by Colleen Ngwarraye Morton, 'Women's Ceremony and Bush Medicine' – sold through our ART page & in our Tetbury gallery. – Big Bill Neidjie, Gagudju Elder, Kakadu. The origins of our art gallery, and now our art-driven interiors collection, is a long-standing personal and professional connection with Central Desert artists. Theirs is an arid land with extensive dry seasons, which is the birthplace of what is sometimes called 'Aboriginal desert painting,' at the forefront of the contemporary Aboriginal art movement. "The chief function of colour should be to serve expression as well as possible." Henri Matisse, from "Notes of a Painter"
Within the indigenous Australian cultures and traditions, the artist holds a sacred individual freedom to engage with their own Dreamtime and connection with country, to express a facet of life through a personal choice of brushstroke and form and colour – all the while anchored within the inherited horizon of a collective dream. The use of colours in the contemporary aboriginal art paintings reflect not only the Australian landscape but the world of their imagination, which encompasses past, present and future. Another detail of local flora from a vibrant painting by Colleen Ngwarraye Morton, 'Women's Ceremony and Bush Medicine' – sold through our ART page & in our Tetbury gallery. Alice Springs lies at the heart of this region, between the dramatic MacDonnell Ranges and the Todd River. It has historically been a place "crucial to the development of art and as a meeting place, place of exchange and part-time residence for people from the hundreds of Aboriginal communities throughout the central, northern, southern and western regions. "* The resilient spirit of its communities, the role they play in political & cultural movements remains very much alive, notably with the iconic annual Desert Mob Art fair. Throughout, the work of the indigenous artists we represent is a reflection of their personal engagement with a historical and deep spiritual affinity to the land, which they tell and re-tell through art to old and new audiences, layering creation myth upon botanical record, wisdom upon experience, colour upon colour. *quote from McCulloch's very excellent Contemporary Aboriginal Art: The Complete Guide. Michael Nelson Jagamara: Lightning Strikes at Merricks! Michael Nelson Jagamara’s dynamic new sculpture series Lightning Strikes are fabricated in stainless steel, bronze or polyurethane with 2 pac paints in a range of colours. His work is part of the 'Weather Patterns' exhibition currently showing at Fireworks Gallery, Brisbane, until 13th April 2017. "Yesterday I went to Fortitude Valley in Brisbane to meet gallerists Mike Mitchell of Mitchell Fine Art and Michael Eather of Fireworks Gallery, both Aboriginal Art specialists. They’ve been in the industry for decades so it was a pleasure to meet them both and see their current exhibitions. “Weather Patterns II", at Fireworks Gallery, features the work of Matthew Johnson, Rosella Namok and a personal favourite of mine Michael Nelson Jagamara, for whom I had the privilege of doing a sell-out show early on in my career. Weather Patterns II, featuring the work of Matthew Johnson, Rosella Namok and Michael Nelson Jagamara (featured above), showing at Fireworks Gallery, Brisbane, until 13th April 2017. ‘Monochrome’, at Mitchell Fine Art features the work of hugely talented desert artists such as Dorothy Napangardi, who recently exhibited in the 2015 'Australia' show at the Royal Academy. Abby Loy Kemarre, Bush Leaves - part of the 'Monochrome' exhibition at Mitchell Fine Art, until 1st April 2017. If you missed it, the substantial 'Australia' exhibition at the Royal Academy investigated the social and cultural evolution of Australia through its art, from 1800 to the present day. The past two hundred years have seen rapid and intense change, from the colonisation on an indigenous people to the pioneering nation building efforts of the 19th century and the steady urbanisation of the last 100 years. The exhibition drew on some of Australia's most significant public collections, showcasing the breadth of the landscape and its diverse people through early and contemporary Aboriginal art as well as the work of early colonial settlers & immigrant artists, and some of today’s most established Australian artists. Here's an more in-depth video of the exhibition, for those with a keen interest! As Spring finds its way back to England, we at Bay Gallery Home are getting ready for a sourcing trip into Australia's remote Central Desert region. Bay Gallery Home's origins are intimately connected with this country, initiated when one of the Northern Territory communities approached founder Alexandra to represent them in the UK. The seeds of Alexandra's relationship with these artists can be traced back to the roots of her family's own connection with Australia, when a French ancestor arrived in Australia in the 1880's. From being early collectors of Aboriginal artefacts to working on Aboriginal accounts and nursing their communities, successive generations have maintained an association with these communities. Bay Gallery Home's relationship with the Central Australian Aboriginal artists is one of trust, founded on respect for their heritage and contemporary way of life. A sourcing trip is an adventure in itself, full of dust and heat and a challenge to the best laid plans of mice and men – yet replete with treasure. Our month-long journey will start from Alice Springs, moving across the Northern Territory into the APY lands, visiting Uluru, Kings Canyon and our Aboriginal communities, including Papunya Tula – the birthplace of the contemporary art movement. We will then head up through the Northern Territory, crossing into Western Australia where we will make our first stop at Halls Creek, after 19 hours driving on dirt roads. After staying here for a few days, it will be time to head out again towards Kununurra, where we’ll be sourcing some Kimberly artwork. These artists notably still work with natural ochres, and have a completely different style to that of the communities we currently represent. Detail from a Water Dreaming by Shorty Jangala Robertson, a famed colour-field abstractionist. The original is available to buy through our ART gallery. An important part of a sourcing trip is taking the time to meet with the artists, to understand the evolution of their art and re-establish relationships. Alexandra's young children will be travelling with her and are really looking forward to meeting and playing with the Aboriginal children. Language is no barrier to the young, it’s bound to be a moving experience watching them contemplate each other for the first time. We will be open for business as usual, and will be updating you all on our epopees via Instagram and this website.